Why all the Disney talk? Well, today 7 other kid bloggers and I challenged ourselves to come up with easy, Disney Inspired Crafts. But wait, there's a catch... we have to make the crafts with... kitchen items! (Duh, duh, duuuuuh!) So stick around to the end of the post to see the other ladies' great ideas! I thought it would be fun to make Chuck some Disney Character Snack Bags. They took a couple of minutes to make, and really make the bags special for kids. DIY Disney Character Snack Bags! Then, I placed a plastic snack bag on top of the character and traced it with a Sharpie Marker . Not sure why, but there's something really special about using mom's "special Sharpie" markers. He was really, really careful with his work! Tada! Here are our finished bags! Right now we're using them to hold some toys, but the bags could also hold food too. I'm just not sure if they would wash very well. We want to save our artwork, so we're not going to let them get wet. 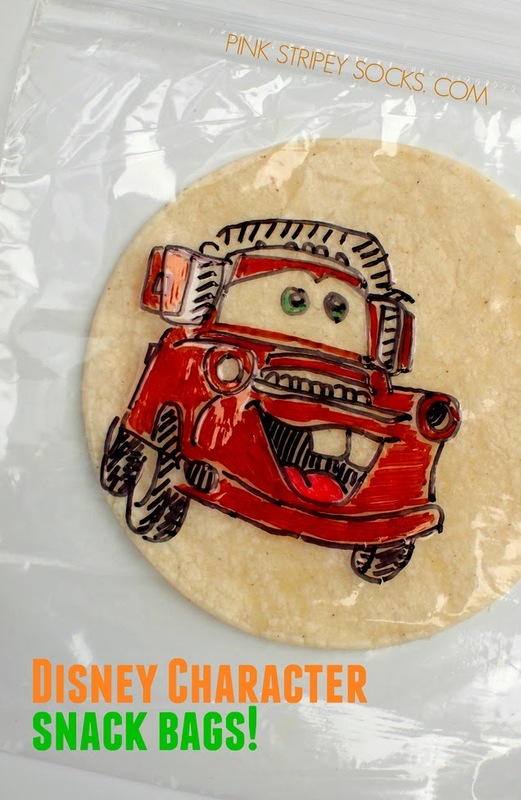 And if you liked this Cars-inspired craft, you'll probably also love my DIY Lightening McQueen Shoes, No-Sew Lightening McQueen Costume, and Dusty Crophopper Toilet Roll Planes! 7 other fun Disney Character Crafts!